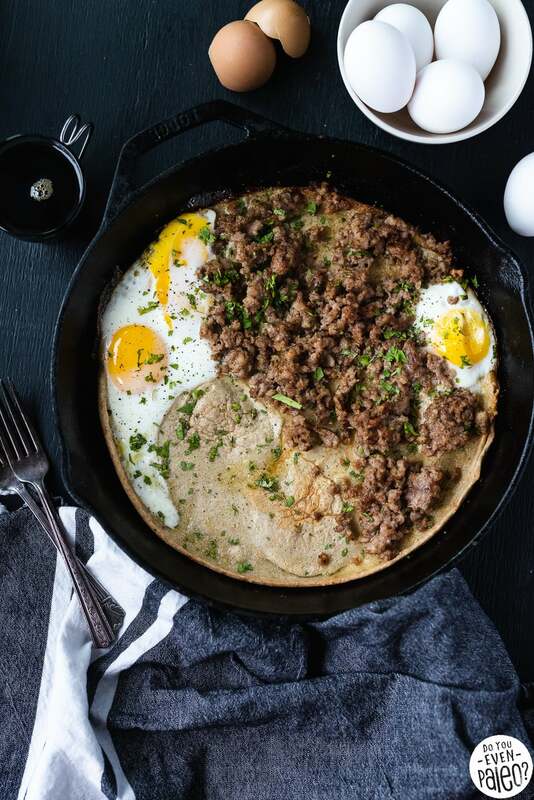 Introducing your favorite new one-skillet breakfast: Sweet & Savory Paleo Dutch Baby Pancake! 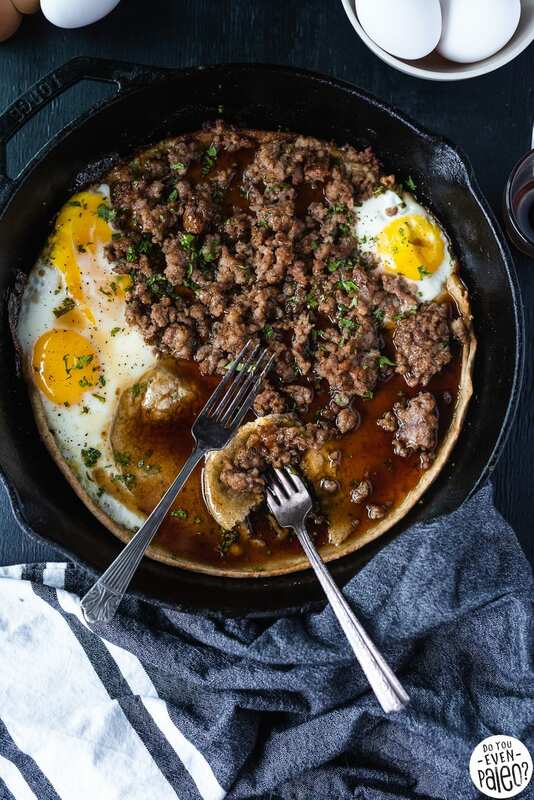 Top a simple gluten free oven-baked dutch baby pancake with eggs, sausage, and sticky-sweet maple syrup for the kind of breakfast you spend all night dreaming about. Typically, recipes are on a schedule for me. I plan out recipes I want to post each week well in advance so I have plenty of time to test, refine, and photograph each post. But every once in a while, an idea burrows its way into my thoughts and I can’t seem to shake it ’till I make it. This Sweet & Savory Dutch Baby Pancake is one of those recipes. 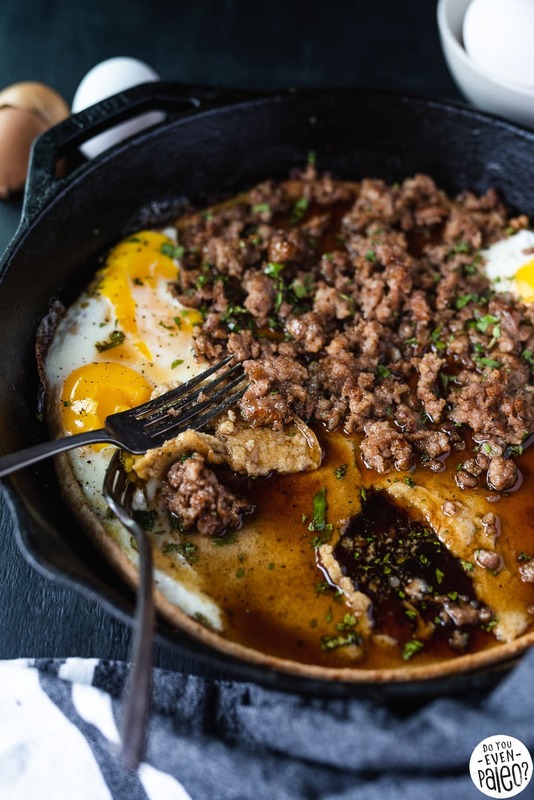 Inspiration came from two different “savory breakfast” dishes from two amazing restaurants. First is the Lumberjack Pizza from Blackbird Woodfire Pizza in Fargo. Second is the Savory Gluten Free Cornbread Waffle from Birchwood Cafe in Minneapolis. 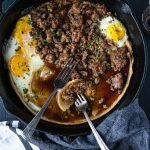 In both cases, the recipe features a savory starch base (pizza crust or waffle) topped with pork, eggs, and maple syrup. 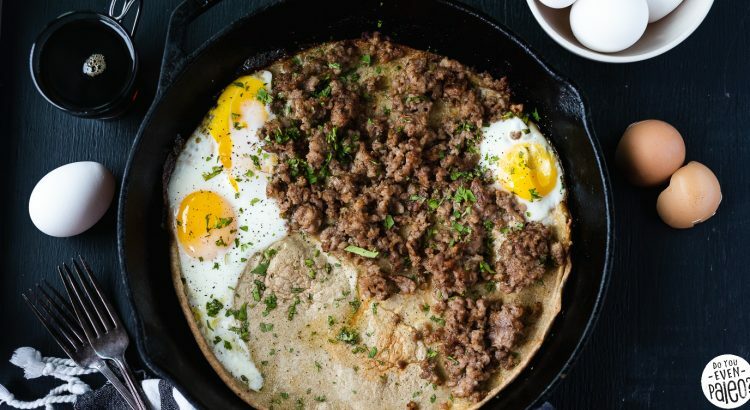 I couldn’t shake how epic the combo is, and soon it occurred to me that I could create something similar with a simple paleo dutch baby pancake as my base. And boy, was it WORTH IT! Each bite delivers the sweet and savory duo I wanted. 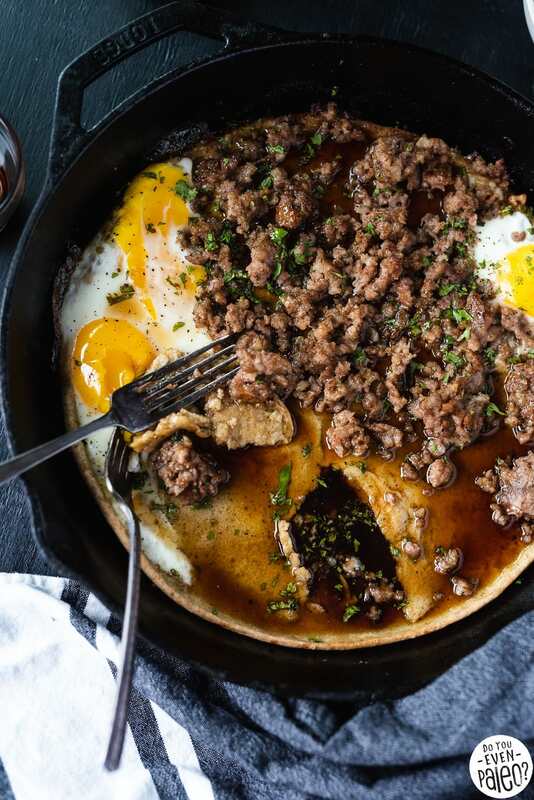 Between the easy dutch baby, baked eggs, breakfast sausage, and a drizzle of sweet maple syrup, this skillet breakfast is completely loaded. Seriously, breakfast doesn’t get much better than this! And I’ll wholly admit that while this recipe could easily be for two, I definitely ate the whole thing myself in one sitting each time I tested the recipe. Breakfasts like this don’t happen all the time, after all. Gotta take advantage while I can! This is the type of breakfast you spend all night dreaming about. 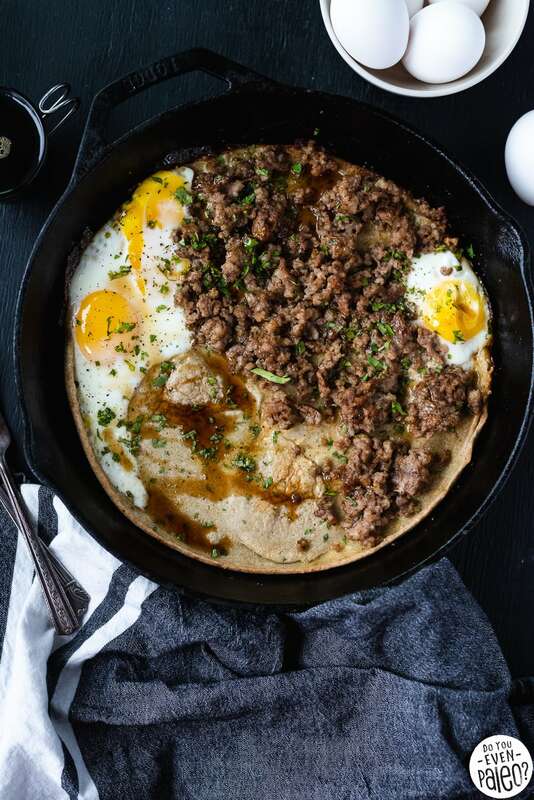 A paleo dutch baby pancake topped with eggs, sausage, and a drizzle of sweet maple syrup. 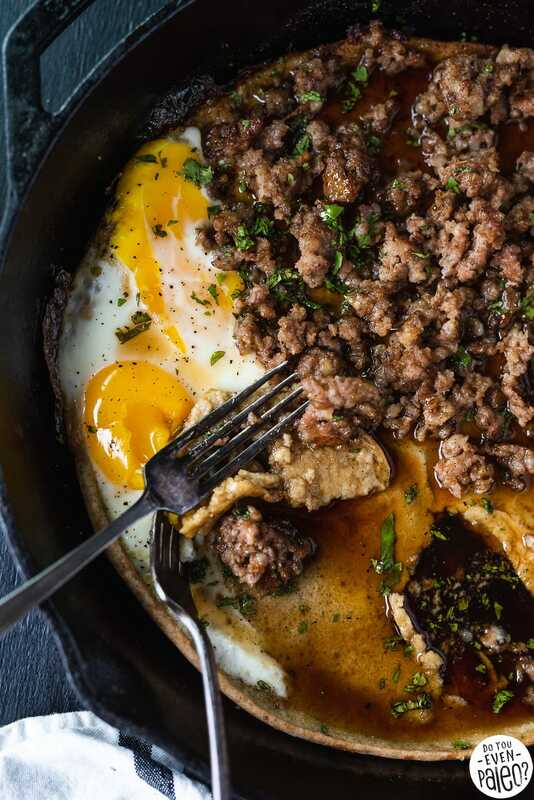 Add 4 tablespoons ghee to a 10” cast iron skillet. Place the skillet on the middle rack of the oven and preheat to 450 degrees. Add 4 eggs to a food processor or high powered blender and blend until pale and frothy. Add almond milk, 1 teaspoon lemon zest, cassava flour, arrowroot powder, vanilla extract, cinnamon, salt, pepper, and 2 tablespoons ghee. Blend until smooth (the batter will be thin). Remove the skillet from the oven, pour in the batter and immediately return to the oven. Bake for 12 minutes. Meanwhile, preheat another skillet over medium-high heat. Add the sausage and brown slightly for 5 minutes, using a spatula to break up large chunks into smaller pieces. You don’t have to cook the sausage all the way through — the oven will finish it off! 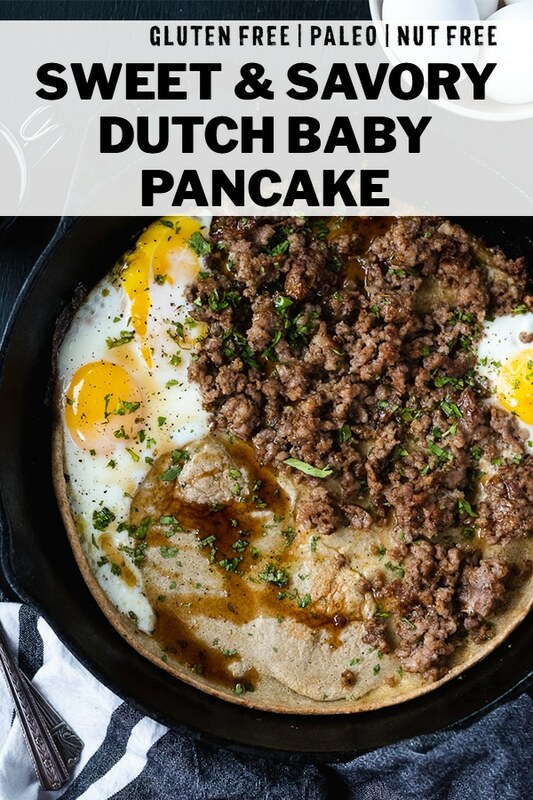 Once the dutch baby pancake has baked for 12 minutes, pull it out of the oven and quickly add the sausage. Crack the remaining 2 eggs directly onto the dutch baby. 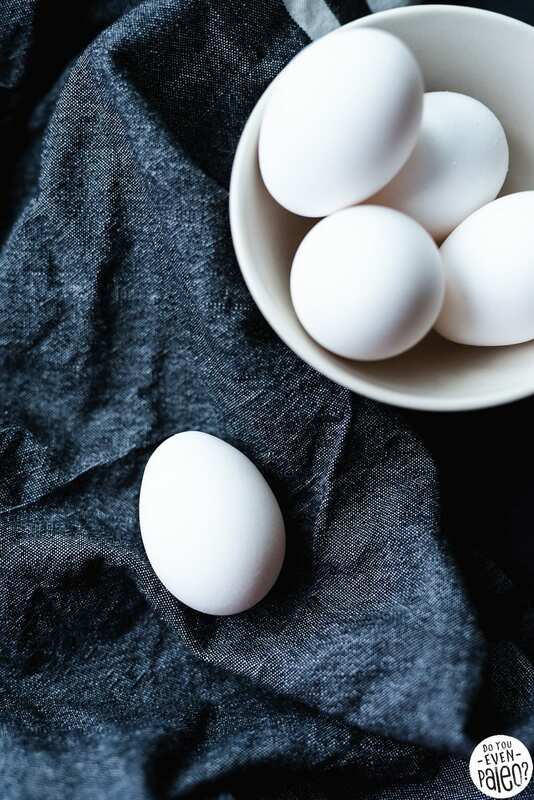 Immediately return to the oven for an additional 3-5 minutes or until the eggs are cooked through. 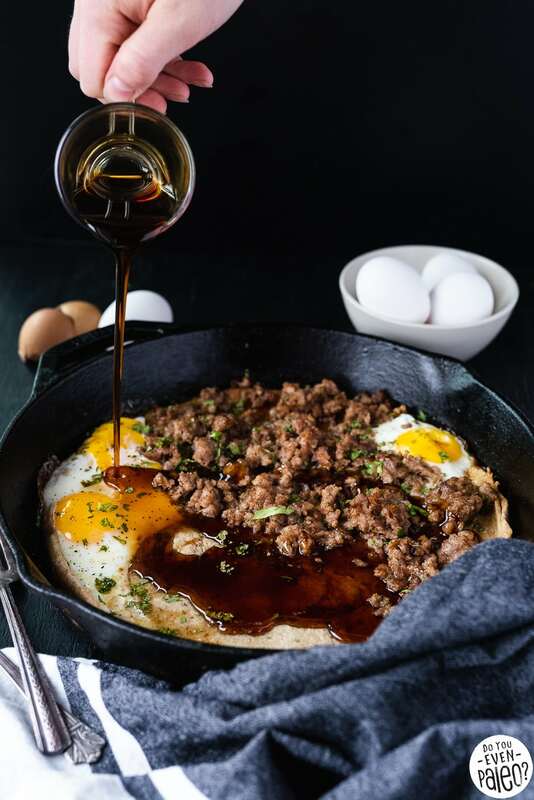 Top with a drizzle of maple syrup, minced parsley, and remaining lemon zest, serving immediately. Don't subscribe All Replies to my comments Notify me of followup comments via e-mail. You can also <a href='https://www.doyouevenpaleo.net/comment-subscriptions/?srp=5445&srk=87505361eee98908ddf6ccb8681f50d6&sra=s&srsrc=f'>subscribe</a> without commenting.